Tomorrow is Spirit Day and Kentucky Equality Federation invites people across the Commonwealth to display one of four graphics to raise awareness of school bullying. 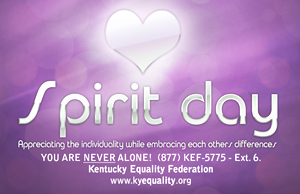 Kentucky Equality Federation invites people across the Commonwealth to display a Kentucky Equality Federation Spirit Day Graphic on your Facebook and other social and media networking sites as your default picture to raise awareness of school-bullying. Additional graphics are available on our Official Facebook Site. Show your support to end school-bullying! 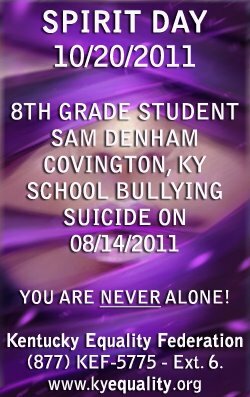 "The suicide of Covington 8th Grade Student Sam Denham on Friday, October 14, 2011 is proof that educators need additional training on how to handle school bullying, and that students who are bullied know they are not alone. It is also proof of failure of the Kentucky Senate, who has in the past killed legislation to expand school bullying laws in Kentucky. However, Kentucky Equality Federation’s Discrimination, Hate Crimes, and School Bullying Committee stand ready to assist anyone who suffers from school bullying. Our children need to be taught tolerance, and the wonderful diversity of people Kentucky has. 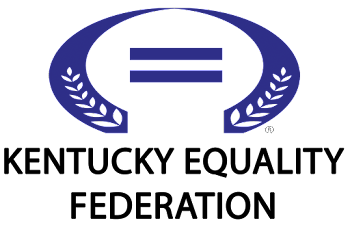 Across the Commonwealth schools have gay, lesbian, bisexual, transgender, intersex, Black, Jewish, Asian, and Middle Eastern students just to name a few. Our children need to be taught about these different cultures and the different types of families across Kentucky. We are talking about basic education to live and let live, diversity, tolerance, and finally the acceptance of others." 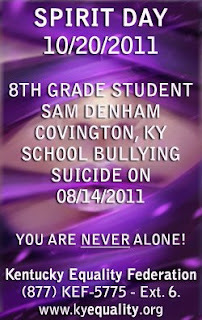 Kentucky Equality Federation extends its deepest sympathies to the family of Sam Denham. Kentucky Equality Federation also extends its thanks to Representative Mary Lou Marzian, Representative Ruth Ann Palumbo, Representative Tom Burch, Representative Joni L. Jenkins, Representative Arnold Simpson, and Representative Jim Wayne, and Susan Westrom for continuing to try to make our schools safer and protect the bullied in our struggle for equality. "Kentucky Equality Federation’s Discrimination, Hate Crimes, and School Bullying Committee have intervened in the bullying of students in four high schools and two middle schools in 2011 alone, added Kentucky Equality Federation Chairman of the Board Richard T. Jones. We typically go directly to the Principal of the school for immediate resolution. If an immediate resolution is not forthcoming we contact the Board of Education as well as the Office of Secretary of Education." Kentucky Equality Federation sent out a survey to candidates seeking the Commonwealth's highest office, Governor. The Gatewood/Riley Campaign is the first the respond, all survey's will be released prior to the election. Kentucky Equality Federation thanks the Gatewood/Riley Campaign to be the first to respond. Kentucky Equality Federation does not endorse political candidates; as the Commonwealth's largest all-volunteer gay, lesbian, bisexual, transgender, and intersex organization we will publish the questions we asked and the responses for all the see. Answers will soon be published in a spreadsheet.